GripClad introduced this Grating to a section of river-side footpath running through the heart of a National Park. This pathway is very popular, as it winds through some of the Park's most scenic areas, showing nature off in all its glory. A Trusted Safety Solution giving safe access for visitors for years to come. This National Park is centred on a range of hills. It is home to miles of picturesque walks and activities, the Park has been protecting the land for over 60 years. The project was undertaken because an existing section of public footpath adjacent to a river was being undercut and falling away due to river erosion. Three sections of boardwalk needed to be installed. Due to the steepness of the ground on the riverside, the warden designed a cantilever structure that would have piers out into the adjacent field that were concreted in and buried to counteract the lever forces from people using the outer edge. If you opt for long lengths of timber then you need to add cross members into your subframe to support the timber, which takes more time and cost. There is an additional time/cost implication with timber: either requesting non-slip to be installed from the supplier of buying and adding it yourself. 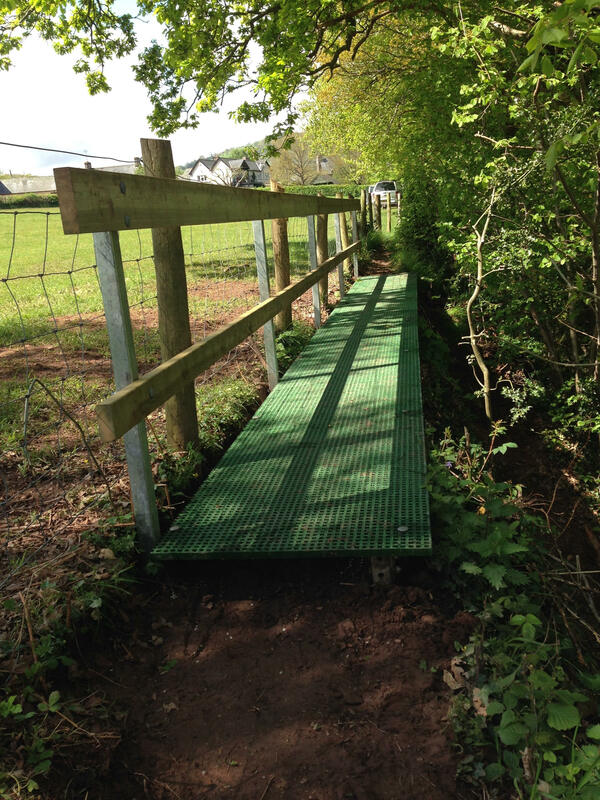 GripClad mini-mesh overcomes these obstacles by being easy to install and safer than timber. The advantage of GripClad GRP mini-mesh is that its integral strength allows you to design in an overhang. The mesh structure also allows light in underneath causing vegetation to grow back, which in turn will help stabilise the banks underneath.